This year’s Rookie IndyCar class is filled by 4 full time participants, 1 partial season, 1 potential competitor and 1 Indy Only competitor... As De Silvestro, Romancini and Sato will contest the entire 17 race schedule, with Baguette having come onboard for the entire season after missing the first two events. Howard currently has a 5 race deal while Beatriz makes only her second start at Indy and is in search of more races in the future. And Saavedra is a “One-off” for this year’s Indy as he hopes to capture the Indy Lights title this year in his sophomore season. This 19yr old Columbian Teenager is currently contesting his second Indy Lights season after having finished as the rookie of the Year in 2009, finishing third overall and capturing two wins while driving for AFS/Andretti Green Racing. His first win came in only his fourth start on Kentucky’s Oval, with his second win coming on the Streets of Toronto. Sebastian began his racing career in the traditional European manner of go Karting before moving up to Formula BMW Single Seaters in 2007. He has raced in a variety of Formula BMW Championships, including USA, Germany and Asia, along with capturing four victories. He also finished runner-up in the 2008 ATS Formel 3 Championship with three wins. 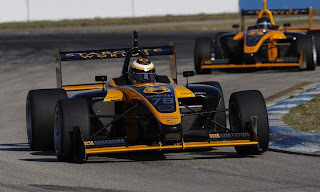 Currently Saavedra is part of ex-IndyCar Driver Bryan Herta’s two car Indy Lights Team, partnered with BRIT Stefan Wilson, hoping to contest for this year’s title along with graduating to the ‘BIG BOYZ in the future with BHA. For 2009 Mario switched to the Indy Lights Championship with Anderson Racing and in his fifth start from Pole, scored his maiden FIL victory on the Milwaukee Mile. Romancini took his second Oval track victory at the season finale in Homestead before bolting to the ‘BIG BOYZ for 2010. I’m sure it had to be very emotional for Mario to be making his Indy Car debut in his Hometown of Sao Paolo this past March. This 24yr old Belgian is the reigning World Series by Renault (WSR) Champion, having begun his climb up the Formula Renault ladder in 2004; progressing from their 1600cc category to the 2.0 Formulae before entering the top rung (3.5 liter) in 2007. Then in Twenty-oh-Nine Bertrand clinched the WSR Title by 57 points over current Lotus Racing F1 Test/Reserve Driver Fairuz Fauzy. Baguette has since brought Royal Automobile Club of Belgium sponsorship in tow with him to Countryman Eric Bachelart’s Conquest Racing Team, making his Indy Car debut at Barber Motorsports Park in Alabama. Also known as “Bia,” Ana “Bia” Beatriz Di Figueiredo is a 25yr old Brazilian who like Mario Romancini is also from Sao Paolo and she too had the honours of beginning her Indy Car career on her Hometown Streets of Sao Paolo earlier this year. Hmm? Perhaps she’ll replace Milka-licious in the future? The 33yr old Japanese “Rookie” hasn’t exactly had an easy introduction into the world of Indycarz... As this likeable Japanese Open Wheel Racing Star began his career in the not so traditional world of Bicycle racing before making the jump to Go Karts at the relatively late age of 19, before leaping into the All Japan Formula 3 series in 1998, but “Taku” then broke his contract at mid-season in order to pursue a racing career in Europe instead, finally settling upon competing in the British Formula 3 Championship. For the 2000 season Takuma finished third before claiming the title the following season and winning an impressive 16 races between 2000-01. For 2002, Sato joined the Honda powered Jordan F1 Team and partnered Giancarlo Fisichella, whith his best result coming at Suzuka where he scored his inaugural Grand Prix points (2) with a popular fifth place finish. For 2003 Taku-san moved to the BAR-Honda Team as its Test Driver before replacing the sacked Jacques Villeneuve “Just-in-Time” for the season ending Japanese GP where he finished sixth, before becoming Jenson Button’s teammate the following year. Ironically Sato garnered his only podium finish at the 2004 USGP at Indianapolis where he came home third, as ’04 was to be the High-water mark for the Team in all of its various BAR/Honda guises, finishing runner-up to Ferrari in the Constructor’s Championship. After a dismal 2005, Sato was replaced by Rubens Barrichello in the new Honda “Works” Team, opting to race instead for Aguri Suzuki’s hastily set-up “B-Team” which was commonly known as “Super Best Friends,” nee Super Aguri, where Taku performed admirably from 2006-08 when the Team was shut down due to lack of finances... With Sato scoring the squad’s only Grand Prix points. Sarah Fisher RacingJay Howard: Great Britain (No. 66)This 29yr old Briton made his initial trek Across the Pond some six years ago when he made his U.S. Formula Ford Zetec Series debut in the middle of 2004, capturing his first victory at Sebring. For 2005, Jay thoroughly decimated the field by winning nine events, including six in-a-row enroute to winning the Rookie of the Year and Series Championship. For 2006, Sam Schmidt naturally opted for the Briton who rewarded Sam by winning the then Indy Pro Series on the back of two victories in his inaugural season. Unable to catch the eye of any potential Indy Car Owner the following year, Jay took a three race gig in the Indy Pro Series before Marty Roth inked the Englishman to a ‘Big Boyz ride for the following season. Unfortunately Jay’s Rookie season in IndyCars didn’t go exactly as planned, when Howard was abruptly dropped during the Month of May to make way for Paying Driver “Gentleman John” Andretti, whose one race deal mushroomed into several more races before Howard made his fourth and final start for Roth Racing at Watkins Glen in 2008. 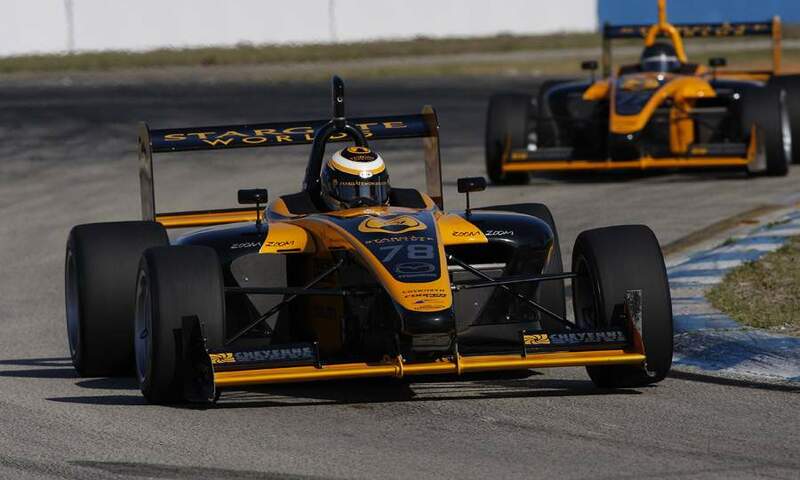 Trying to rekindle his Open Wheel Racing career, Jay returned to what had now become the Indy Lights for 2009 with Start-up Team PBIR, before running into funding issues once again. Yet Jay has now landed a partial season ride with Sarah Fisher Racing, with five events currently on the 2010 calendar and potentially more. Yet his 2010 campaign has gotten off to a somewhat shaky start, as Jay first crashed out at Kansas, which was the Team’s warm-up for this year’s Indy, where Jay failed to qualify upon the Team’s last minute decision to withdraw his time and hopefully re-bump his way into the field which he was unable to do.